The Red flowing wattle ‘ Scarlet Blaze’ is a variety of Acacia leprosa and is rare in the wild. An accidental find this wonderful plant is known in cultivation as, Acacia leprosa ‘Scarlet Blaze’. As such a unique specimen it was named as Victorias Centenary of Federation floral emblem. This is a form of the well known Cinnamon Wattle. A small to medium growing plant reaching around 4m in height depending on conditions, with a nice weeping habit and deep red flowers this is a unique plant. Acacia leprosa ‘Scarlet Blaze’ requires a well drained position in full sun, protection from strong winds is advisable. Pruning is not recommended and many gardeners who have tried to promote a more upright habit habit by staking the plant have run into trouble, this is a ‘plant me and leave me alone species’. They do not grow well in windy conditions. As this is a most attractive tree it could be grown as a feature in the native garden. In a large container it would also make an excellent specimen. Reaching around 4m in height and with an attractive weeping habit this is a tree with a real future in Australian gardens. If you are in Melbourne a wonderful example is located in the Botanical Gardens. It can be a little expensive as it is only grown from cuttings. It will not come tee to colour from seed. 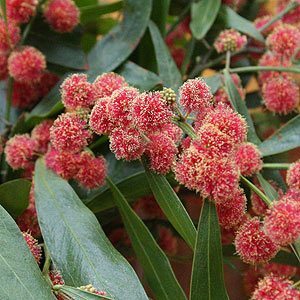 Acacia Leprosa ‘Scarlet Blaze’ being of significant importance for the home gardener and landscaping industry. It is a relatively new discovery (1995) and only released in 2001. Wattle Nursery. Specializing in beautiful, rare and endangered species of Acacia. Visit the Wattle Display garden by appointment.